For most players and squads, simple mistakes are a common problem. They are frustrating, agonizing, and painful, but unfortunately common. Often the drops, turfed throws, and mental lapses are justified as flukes, execution errors by someone who knows better and written off as inevitable. But simple mistakes can be the undoing of even the most elite team. 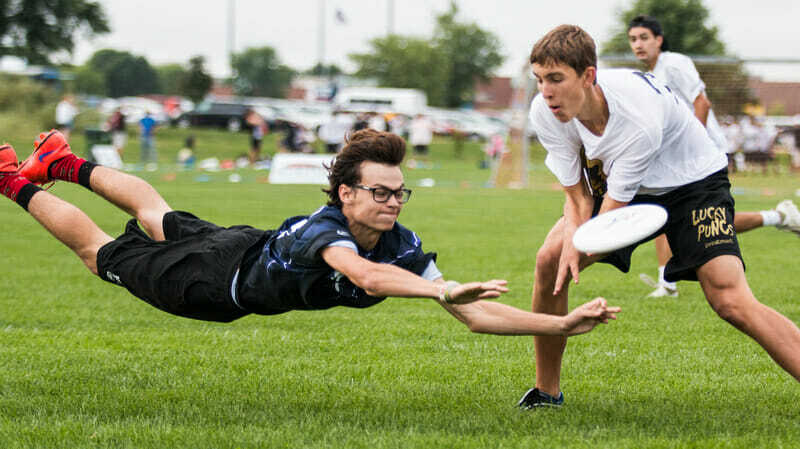 Yes, every so often something that shouldn’t happen, will happen: your best player will drop the disc in the open field, a gust of wind will send a huck sailing out of bounds, or a well-timed cut will get in the way an otherwise open opportunity and ruin the flow of an offense. While many coaches and captains will say they prefer execution to decision mistakes, they should not be ignored or simply shrugged off. It is very possible to improve gameplay, both individually and as a team, to the point where these hiccups — whether caused by mental lapses, bad decisions, or technical failings — almost never occur. The best players and teams don’t just have some inherent talent for avoiding execution errors. They work hard to ensure mistakes happen as infrequently as possible. They are ever vigilant in finding and working to correct mistakes both in practice and in live games. Here are the five easiest ultimate mistakes to make and how to correct them. Yes, this one is obvious and yes, “Go to” is one of the first things every college rookie has yelled at them from the sideline at practice. But that doesn’t mean it is less common or less important to correct. Remember, the easiest mistakes are often the most prevalent and the ones that need to be forcefully identified and fixed as soon as possible. The clearest result of failing to run through the disc is that your opponent will get a D. Most often this is on under cuts with a defender trailing, but can also be on deep shots, when players slow to read the disc or allow other players to push past them for positioning or block out, denying themselves a shot at high huck or floaty pass. However, even at a less obvious level, not fully attacking the disc can create problems like forcing a tougher catch, which is more likely to be dropped, or creating contact that might lead to a disputed foul call or at the very least the mark right on top of the current thrower, likely flustering him or her. A bad throw from an off-balance or bumped player that leads to a turnover is just as damaging as a layout block. How it happens: When a player sees a disc in the air that they feel confident they will catch, they may slow down or stop, failing to run through a disc or catching as soon as they can. Not being aware of their surroundings, trying to milk extra yardage out of a pass, or failing to recognize the advantage of catching sooner and keeping the disc in motion are all likely reasons for hesitation in a receiver. How to correct it: Contrary to popular belief, yelling “man on” or “run through” from the sideline isn’t enough to get the job done. Clearing, as mentioned in previous articles, is very important and very overlooked as a teaching concept. A lot of offense in ultimate revolves around how well players use the space around them. A lot of personal success can stem from clearing properly and timing your next cut. Furthermore, clearing in the wrong way — either too aggressively or not aggressively enough — can not only ruin your own prospects for getting the disc, but can actually stagnate or destroy an offense for a point. How it happens: The most grievous error of clearing is being too aggressive, such as when players will throw upfield and then cut upline past the position of the disc (as in a strike-style cut) that blocks off all other upfield avenues of attack. Any other style of give-and-go or demand-the-disc can be just as dangerous if you’re covered or you block an open teammate. Casually clearing can be just as bad, if it means you aren’t getting out of space for a new player fast enough (blocking them from getting the disc and allowing your defender to hang in a throwing lane without repercussion), or you fail to reposition yourself and miss the next opportunity for the cut. How to correct it: Clearing takes effort, speed, and mental awareness, just as cutting in attacking position does. Einstein said “Doing something over and over again and expecting a different result is the definition of insanity.” If you are losing a matchup on defense or your team is losing a game in which they keep trotting out the same force, do not keep running the same defensive set or style. You must switch it up. A good axiom is “Never lose a game without trying a zone defense.” A better axiom would be “Never lose a matchup without trying at least three different defenses.” Sometimes it is better to embrace the underdog and be unpredictable. Individually, be self-aware of matchups. If you keep getting beat deep by the same receiver, it’s time to adjust — even if in minute ways — whether you are practicing or in important situations. How it happens: Teams have their game plans and they stick to them. The worst thing that happens is team leaders get stubborn and say, “This is what we’ve practiced; we are going to run it until it works.” Who cares what you practiced? Unless you are in a very low-key situation (where the value of working on a specific defense outweighs the benefits of winning) switch it up! How to fix it: As a team, have at least three defensive styles ready in the back pocket. Be analyzing what the other team is doing successfully and how they are scoring. Then, don’t wait. If anything, move quickly to correct or change a defense before the game gets out of hand. The same applies for an individual matchup, especially if you find yourself being ineffective several points in a row. Even subtle changes can make a difference. Deep passes are high-risk, high-reward by their nature and it isn’t surprising for teams — especially teams that struggle to win games — to take chances in order to try to gain an advantage. However, you can decrease your risks in hucking and increase your odds of completed passes by correcting common casual mistakes like when players throw deep on narrow spaces downfield or wait too long to make the pass. How it happens: Deep cutters will either start on the same third of the field as the thrower or angle their cuts to decrease space — throwers will be forced to fit a pass into narrow avenues or toss deep passes over their receivers’ heads. Alternatively, receivers will mistime their cut or throwers will wait until the receiver is too deep before putting up a longpass, minimizing the margin of error and giving the defender a chance to close down the space. These kind of hucks almost never work and need to be watched out for. How to correct it: Don’t worry about the trigger fingers of your team. Telling someone to stop hucking will make them gun-shy and will remove this very valuable weapon. Instead, be smart and use the following tips to make the hucks the best as possible. The gold medal winner in most common mistakes is the drop. However, simply accepting, “Oh it was a drop, couldn’t be stopped,” is doing a disservice. Most drops occur for one of two reasons. Either the player has taken his or her eye off the disc (often to start throwing before catching) or they are letting the disc play them and not going to get the disc; this is often seen in the two handed under hand rib catch, trying to pull in the disc without pancaking, occasionally because it gives you a faster grip for a forehand. If the offense is fast-paced, and especially if there is another open cutter yelling downfield, it makes players more likely to speed up. However, this can happen in even the most common situations if a player takes an easy catch for granted and his or her thoughts are elsewhere. Both of these mistakes come from being too casual or from thinking too fast and rushing the catch. Taking the eye off the disc and/or moving the hands early to get ready to step or throw means that the disc will likely clang off the fingers or the body, or a bobble will occur that will be dropped. Catching requires thought and should be respected as the most important element of the game. How it happens: Players take their eyes off the disc because they want to speed up the throwing process. Or they are moving too quickly to get a grip or step around a mark that they don’t secure the catch and bobble. How to correct it: The simple answer is focus on each and every catch. Only after the disc is secured should you be thinking about or looking to throw. However, that’s easier said than done and so breaking it down into smaller pieces to work on will help players with this problem. These are the most common mistakes in ultimate perhaps because they are among the most fundamental skills; they are taken for granted and can be forgotten as players focus on higher level improvements. On the bright side, that means they are also the easiest to correct. And they do have to be corrected. You and your team cannot ignore them and should not avoid talking about them. Be on the alert and when you see these happen (especially more than once or twice), move to correct the problem. The best strategy can be undone by simple mistakes, turning should-be goals into turnovers and giving opponents more opportunities. Comments on "Tuesday Tips: Correcting 5 Common Ultimate Mistakes, Presented By Spin Ultimate"